No? Just me? (Thanks, Mom.) Well, I’m thinking it must have been Meg Cabot, too—or else, that fake teacher lady must have told her about it—because Blast from the Past, Cabot’s latest middle-grade novel, lived up to its title for this reviewer. In this sixth installment of Cabot’s “Allie Finkle’s Rules for Girls” series, fourth grader Allie Finkle must overcome a slew of obstacles: convince her parents she’s responsible enough to buy her own cell phone (she’s shed blood, sweat and tears saving up the $36—and it is her own money, after all), save her cat from being sealed up inside the walls while the construction guys rid her house of dry rot (ew—and snails!) and survive her first-ever field trip (to lame Honeypot Prairie, not somewhere cool like the SpaceQuest planetarium or the Dinosphere or the rare collectible Barbie exhibit at the Children’s Museum). With her little brother insisting on wearing a hard-hat in public, Mrs. Hunter possibly getting married and moving away and Cheyenne O’Malley being—well—Cheyenne O’Malley, Allie has more than enough on her mind without having to also worry about the presence of her ex best friend, Mary Kay Shiner, and the rest of her former classmates from her former school, Walnut Knolls Elementary. In the effortless way only she can, Meg Cabot disguises life lessons with humor, and she crafts memorable, true-to-life characters. Joey will remind you of that kid in your grade school who always got the nose bleeds, Brittany and her crew will take you back to those girls who wore training bras and made fun of you because you didn’t (unless you’re a dude—then she’ll probably remind you of someone else) and Allie will remind you of the girl you hoped your fourth grade teacher thought you were. The premise of the entire series is that Finkle (or Stinkle, as Scott Stamphley calls her) keeps a book of rules—which she writes, based on what she learns throughout her adventures. While a lesser author might use this as an opportunity to get on her soapbox, Cabot infuses Allie’s rules in a way that always feels fun and never feels preachy. Although it’s the sixth book in the series, one can read Blast from the Past without having read the first five (although if you pick up the others, you’re promised five great middle-grade reads!). As with any of her books in any of her series, Cabot weaves in the characters’ backstories to perfection. With just the right amount of pop culture references and an authentic middle-grade voice, Cabot offers valuable guidelines for kids to adopt in their daily lives—and she makes it fun. I highly recommend this book—and the entire series—to any reader, from middle-grade to adult (one who *ahem* still acts like a kid). **And for my writers out there, this is a fantastic example of tight plotting, great voice, seamless backstory infusion, and character development. It was like President George Washington and I were practically the same person. Boys do even weirder things than that to show girls that they like them, such as try to wipe boogers on them. Oh, okay. Thanks for that. That explains everything. I can’t wait to read Blast from the Past. 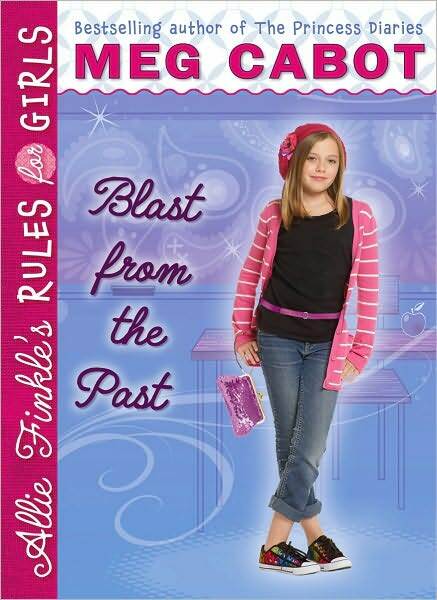 I love the Allie Finkle series and Meg’s other books! Ricki, I’m assuming your box of books from the RWA conference finally arrived. It’s very cute – the book, I mean! Aw, such fun books! Great review, Ricki! I don’t get a chance to read much middle grade any more, so I don’t even know what’s selling now. 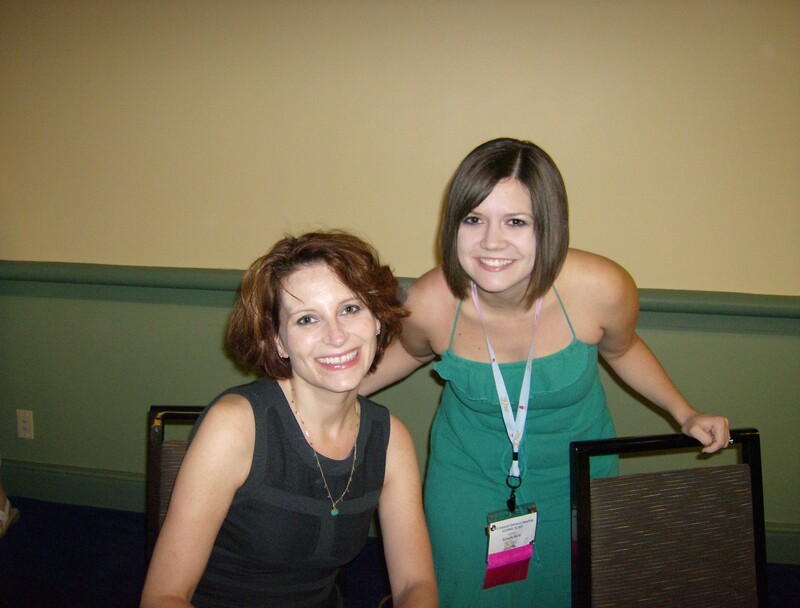 Love the picture with Meg Cabot!